Budapest is a city whose layout has been given much aesthetic thought. With the Danube river and the iconic Szechenyi Chain Bridge just in the city centre, it is any hotel’s dream location. Not too big, but not too crowded either. 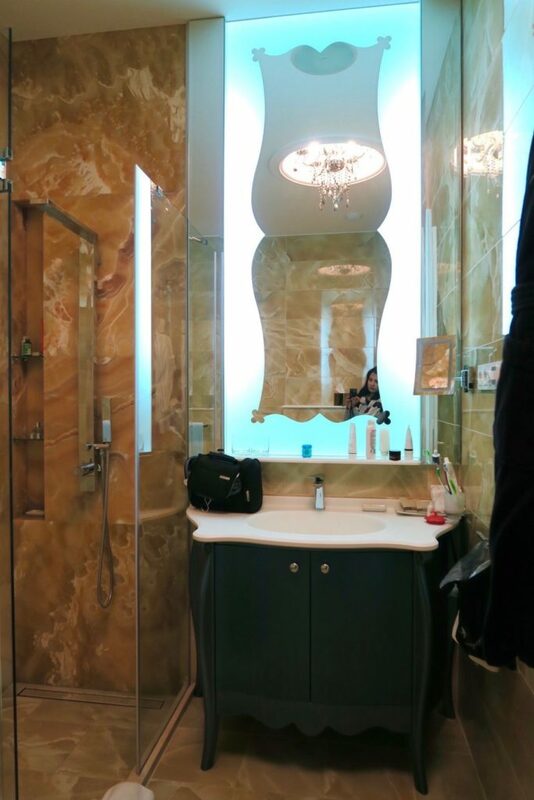 Budapest, therefore is a city that does not lack in hotels, and there seems to be a lot of luxury boutique types and a number of hotels belonging to popular chains. 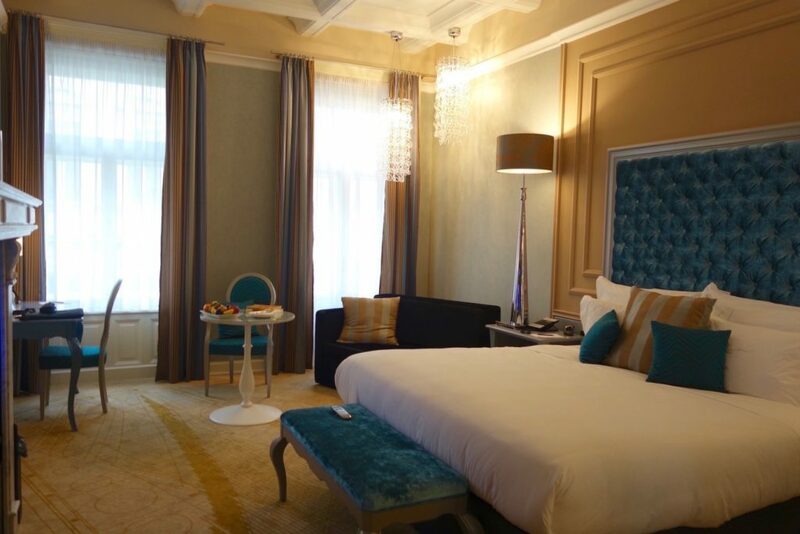 One of the great things about going with a private tour of Central Europe with JayWay Travel is that they have hand-picked a select number of luxury hotels that offer unique experiences. And from those hotels, they give a recommendation list based on your personal travel style. And from that list you can also ask them anything about certain hotels and they will provide feedback. 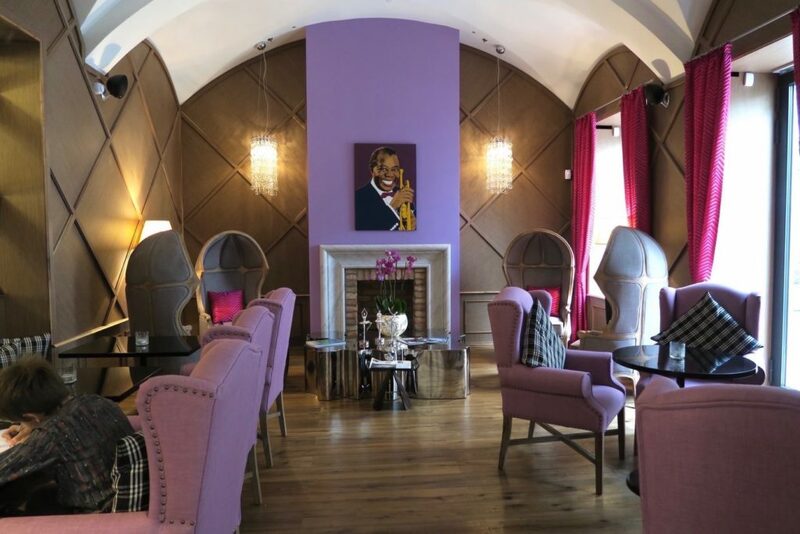 So when they suggested Aria Hotel Budapest (A member of the Library Hotel Collection), I was naturally intrigued when they said that Aria is a hotel for music lovers. And this is very evident upon entering the hotel. 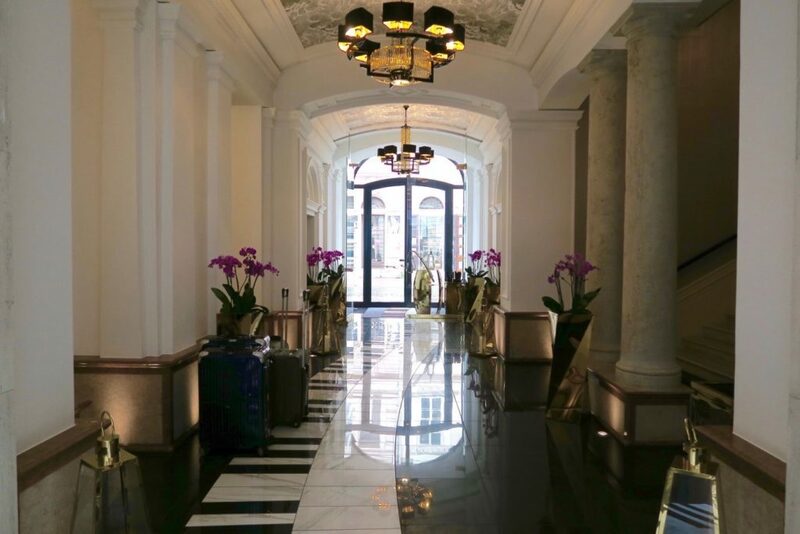 Centrally located (St Stephen’s Basilica is literally next door and the Danube and Szechenyi bridge are just 10 minutes by foot), Aria Hotel Budapest offers a hotel stay experience inspired by music. For the avid music lovers, the Aria Budapest has a resident Musical Director who can give suggestions to your personal music playlist for your stay. Indeed, this is the first hotel I’ve stayed at with such a special position. Based on my preference for classical music filled upon check-in, I was pleased to find out that we were given a room in the Classical Music Wing, and at the Johann Strauss II room no less. The first thing I noticed upon entering the room was the magnificent surround sound system. And in wonderful timing, ‘The Blue Danube’ was playing as we waltzed inside the room. 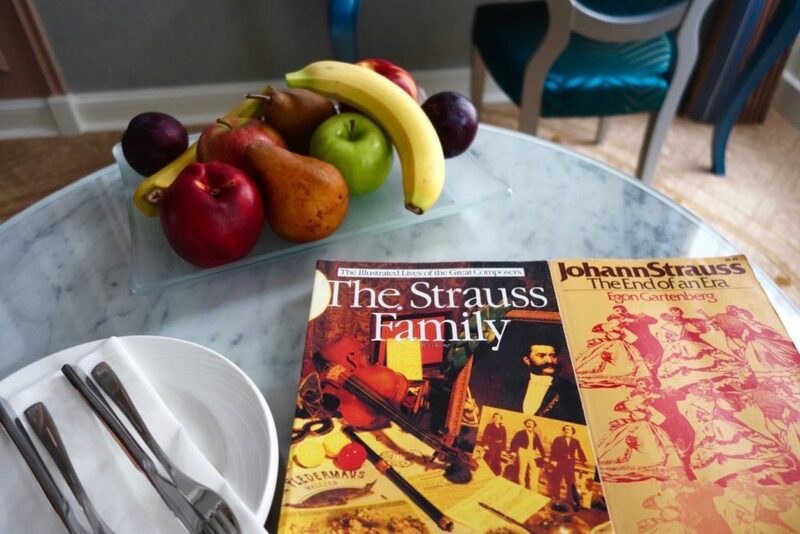 There’s also reading material about Johann Strauss (you are after all, staying in ‘his’ room!) where upon browsing, I found out that his paternal great-grandfather was actually a Hungarian Jew, which made my stay in this room even more meaningful. 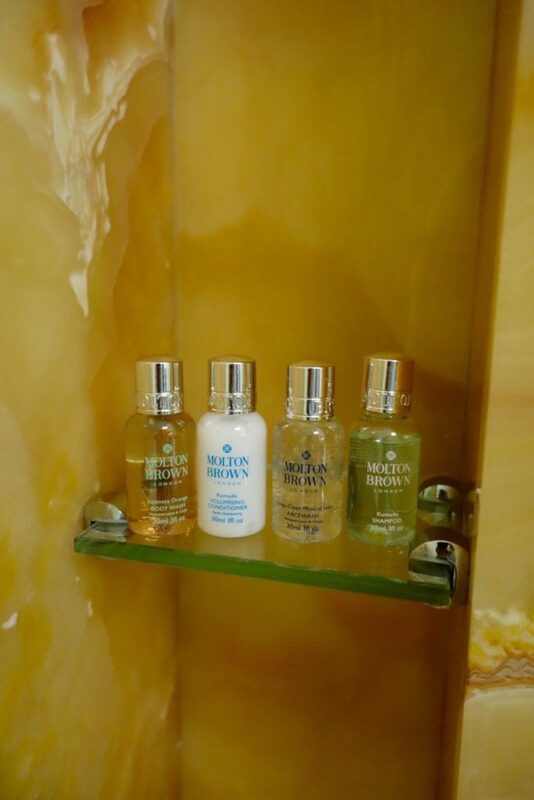 Toiletries were by Molton Brown from their Kumudu Volumising range for haircare, and Japanese Orange for the Body Wash and lotion. Those who may have forgotten their facial cleansers can enjoy a deep cleanse with their Deep-Clean Mineral Ions facewash. I really enjoyed the room we had at Aria Hotel Budapest and if I had it my way, I’d have booked an extra day to just lounge inside the room 🙂 The room also had views of the city but it’s not in a noisy area so the view is still tranquil, just shoppers and tourists walking around. Other wings / rooms include: The Jazz Wing (cool Hollywood glamour with Art Nouveau furnishings, room and music experience range from Billie Holiday to BB King), The Opera Wing (Romeo & Juliet Balcony Suite, La Traviata Opera Terrace Suite, etc) and Contemporary Wing (Pop art style of the 70’s with room and music experience ranging from the Beatles to Elvis Presley). 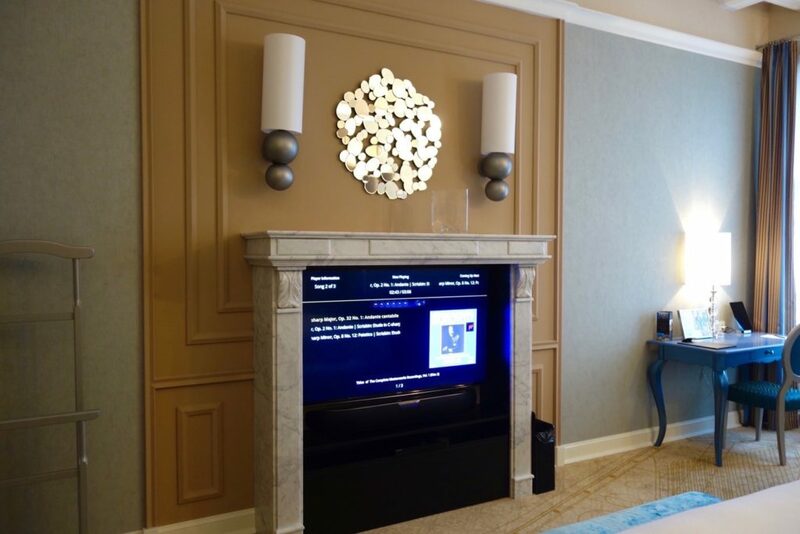 Here’s a room tour of the Johann Strauss II room , along with the other public areas of the hotel. 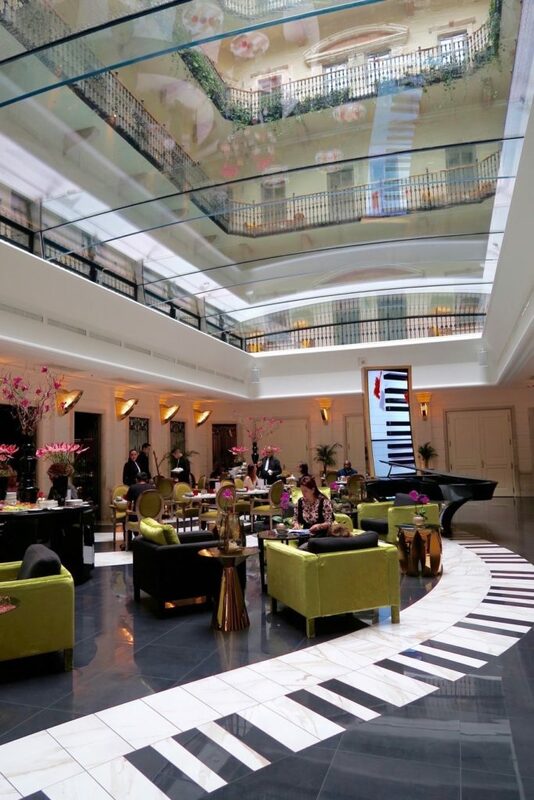 The breakfast area has accents of lime green, and the piano key tiles lead to an actual grand piano at the back of the room. Breakfast buffet is served, while ala carte is also available. There’s also Satchmo’s Bar located off the lobby of the hotel. 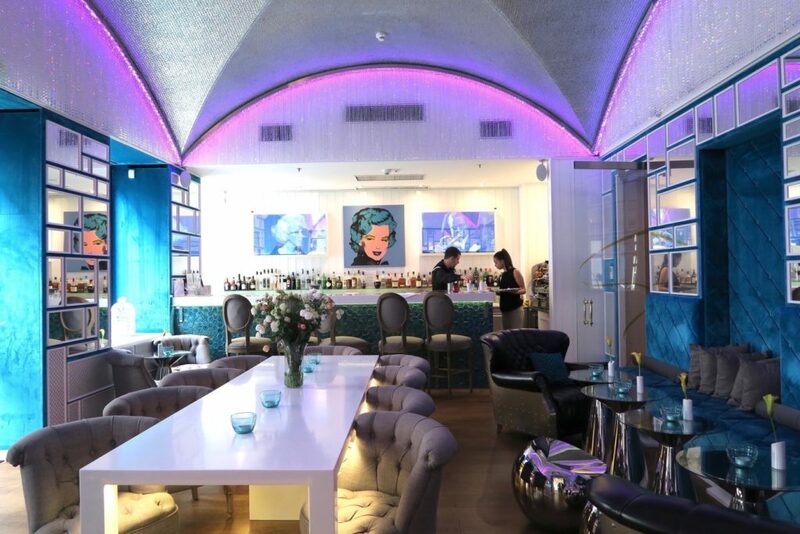 With blue velvet walls and sofas, this place offers light dining for lunch and dinner, along with drinks. Just opposite the bar is Satchmo’s Library Lounge . I just love the interiors of the entire place. Look at those shell back chairs and that portrait of Louis Armstrong. 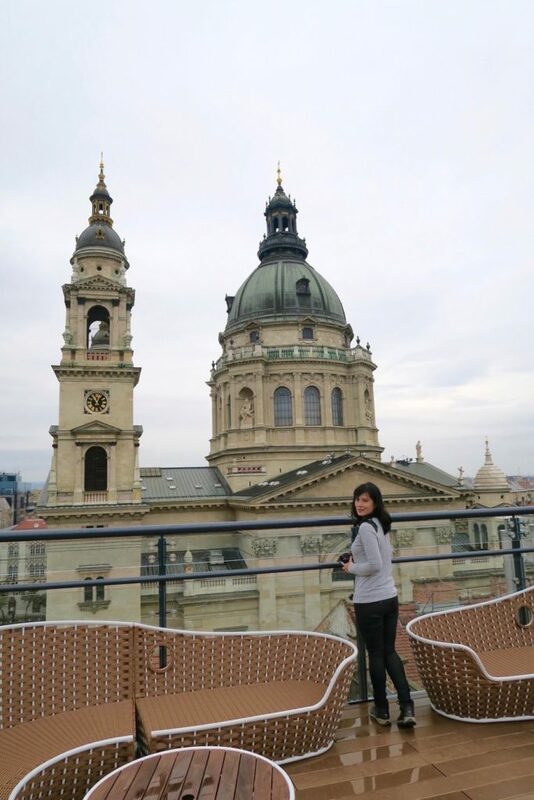 Most notable area would be the Aria Hotel’s rooftop, where you can come face to face with the dome of St Stephen’s Basilica. It was rainy on most days we were there, but I can imagine that during summer, the rooftop would be a very busy place for afterwork drinks, or for guests to just hang out. Again, even their indoor pool and spa displays consistency with the theme. 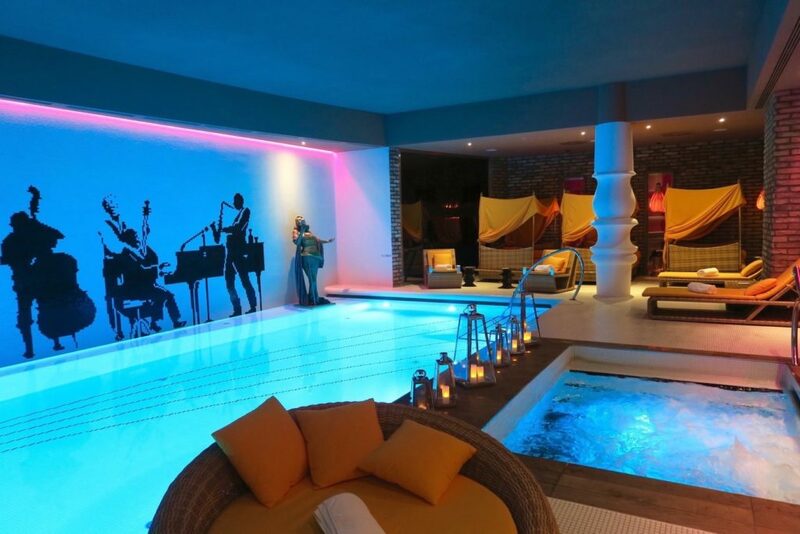 Imagine winding down your day after walking around Budapest, and relaxing in this spa. Such bliss! 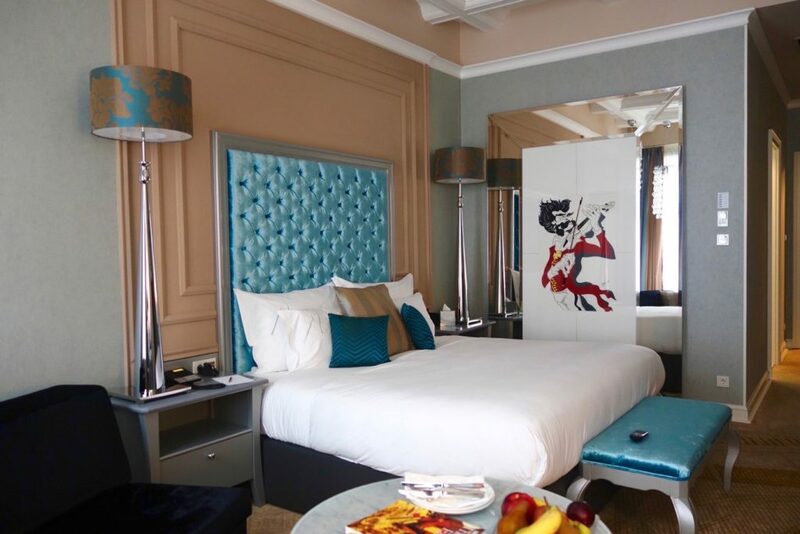 With 49 rooms in total, the Aria Hotel Budapest certainly offers personalised service. Assistance is quick and staff are very proactive in offering them too. 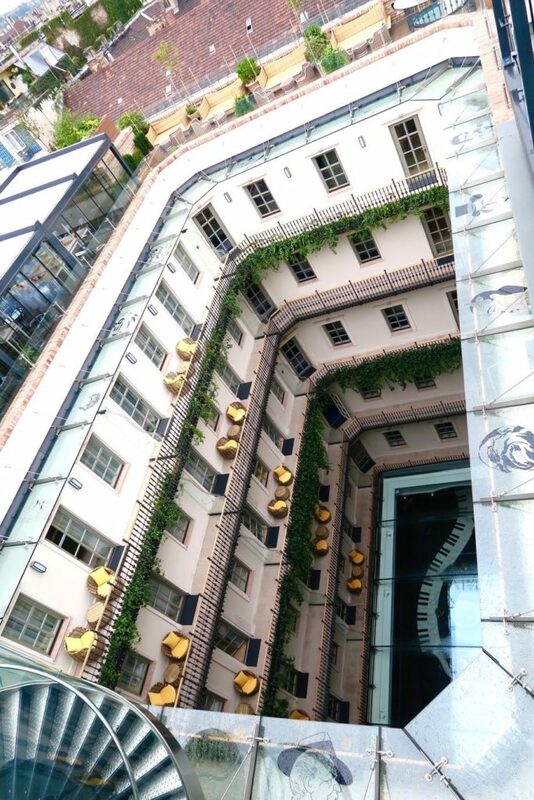 It’s always a joy to discover luxury boutique hotels that offer unique experiences and do it right, and Aria Hotel Budapest certainly is hotel that delivers this best. We were guests of Aria Hotel Budapest as part of our tour with JayWay Travel. There is no obligation for a favourable review, all thoughts and opinions of this post are my own. I’m a big fan of Budapest, we went there on our mini moon! The hotel looks stunning. Check out that pool and the views from that rooftop would be hard to beat! Oh to be in Budapest on a mini or maxi-moon would have been awesome! 🙂 I was pleasantly surprised by Budapest. So pretty! I love that piano floor! It looks like the perfect place to stay! What a cool concept! 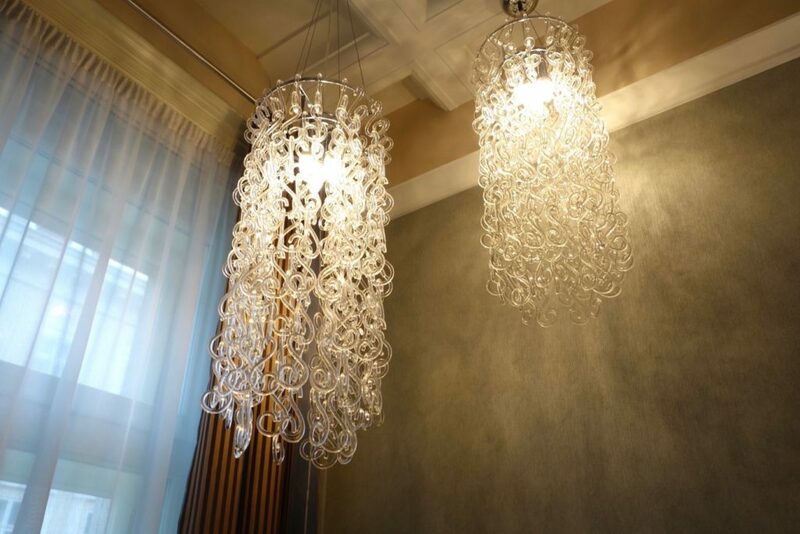 Very luxurious and stylish! Hi Jenn! Thanks for the visit. Yes, the concept is very original, I’ve not encountered a similar hotel before. Love it! Very boutique and appealing. I will get to Eastern Europe one fine day. Any top tips for hotels in Auckland at all?? I hope you get to visit Eastern Europe, very interesting and surprising! Sorry I personally haven’t tried any Auckland hotels that are worth recommending! But Auckland seems to have a lot of established chains (Langham, Sofitel etc) but cannot comment as I’ve not stayed yet.